For about 20 years, the Flatlanders were folklore more than they were a band. Like Billy Eckstine's unrecorded late '40s bop band that featured the young but soon to be famous Miles Davis, Dizzy Gillespie and Charlie Parker, for most of the '70s and '80s the Flatlanders existed only in memories and bootleg recordings. As the band that nurtured the early careers of later underground country singer/songwriter heroes Jimmie Dale Gilmore, Joe Ely and Butch Hancock, the Flatlanders was elevated to a kind of mythical cult status. But unlike, say, the early, Pete Best-era Beatles, the Flatlanders' reputation suffered no damage when the original session tapes of the band's unreleased 1971 album were finally issued on CD by Rounder Records in 1990. In fact, the material was so outstanding that Gilmore, Ely and Hancock found lucrative work touring as the Flatlanders again. After recording a live album, plus a track for Robert Redford's "The Horse Whisperer" soundtrack, the band has released another studio album of all-new songs  and "Now Again" is so near perfection that it just may seal the reputation of The Flatlanders for all time. The band wrote 13 of the 14 tracks here  and the other, "Going Away" by folk icon Utah Phillips, has the same characteristics of timelessness and grace that mark the Flatlanders' own compositions. Hancock's "Julia" may be the perfect country song  impressionistic lyrics of love and loss coupled to a melody pretty enough to make you cry. Well, that's the thought running through your head until a few tracks later Gilmore starts warbling "My Wildest Dreams Grow Wilder Every Day," and now you're thinking, "This is the best country song ever written." It's got more of an old-school Grand Ol' Opry feel to it than "Julia," but just as gorgeous a main theme. Okay, only now Ely's countrified rockabilly sensibility takes over on "I Thought the Wreck Was Over," and you're wondering how on earth one band can have three songs this good on one album. And you've not even gotten to the luscious dirge of "Yesterday Was Judgment Day," the achingly plaintive "Now It's Now Again," the cry-in-your-beer love song "All You Are Love," or the deep honky-tonk of "You Make it Look Easy." Picking a favorite song from this album is no easy task. In addition to having great songs, the Flatlanders are also one of the few bands in country music still using traditional instruments like the accordion, harmonica or musical saw. The acoustic guitars outnumber the electric ones, those would be mandolin and banjo you hear on several tracks, and there's even a dobro. Then there's the singing. More than any blow-dried pretty boy singer out of Nashville, the deep nasal tones and East Texas twang of Jimmie Dale Gilmore's singing hearkens to the heart of country music. Hancock and Ely share the singing with Gilmore on this album far more than on the first one (in which Gilmore sang lead on most of the songs), and those East Texas roots shine through their voices as well. On the song that could be the band's anthem, "Right Where I Belong," Ely sings the opening verse with a shimmer to his voice that Elvis would salute. Gilmore takes the second verse, and then Hancock takes the third with that dry, quasi-spoken style of his that charms through its spartan plainness. Hancock and Ely are pretty decent guitarists, too  their appearance on David Letterman's show earlier this year proved that they can play their own solos with no need for hot-shot session musicians. 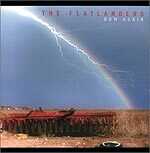 Whether you think you don't like country, or you're a true country fan who's sick of the suburbanization of the music, the Flatlanders create such a sense of magic that you're likely to fall very deeply under the spell of this album. It is one of those rare efforts that has almost no dull spots, contains not one boring song  and is held together by a sense of fun and companionship that comes right through the music. It is as close to perfection as music can get.